Though most athletes wish they had unlimited time to train and focus on their sport, the realities of having a family, career, mortgage, and car payment mean we have to find an equitable balance. For amateur athletes, family and career typically—and appropriately—take precedence over training, and many find they are trying to perform at their best on about 6-8 hours of training per week. Can you be a high-performance athlete on such limited training time? Yes. A lot of the athletes you see pushing the pace at the local group ride and winning local criteriums and cyclocross races are using low-volume, high-intensity time-crunched training programs. You can take advantage of the same keys to success that they utilize, too. Training consistently is perhaps more important than the specifics of what you’re doing during each training session. To achieve positive adaptations, you have to stress your body at regular intervals, separated by adequate recovery. If the recovery period between training sessions is too long—like when you ride only on weekends—then the overload/recovery balance is tilted too far to the side of recovery, and you won’t make continued progress. The best balance I’d recommend for busy career professionals and working parents is to aim for four workouts a week, either two weekdays and both weekend days (Tuesday, Thursday, Saturday, Sunday), or three weekdays and one weekend day (Monday, Wednesday, Friday, and Saturday or Sunday). Within these schedules you can change the separation of days or create two- or three-day blocks to adjust workload and the overload/recovery ratio. A simple way of thinking about training workload is as the product of volume and intensity (Volume X Intensity = Workload). When training volume diminishes because of other priorities in your life, the only way to retain or increase your training workload is to increase the intensity of your workouts. In practical terms, this means that time-crunched athletes rely heavily on 60-90 minute high-intensity workouts that include VO2 max intervals or lactate threshold intervals. Low-volume trainers can take advantage of this type of training because of the built-in recovery that a 3- or 4-day-per-week training schedule includes. If you’re only training four days a week, then you have three recovery days per week. 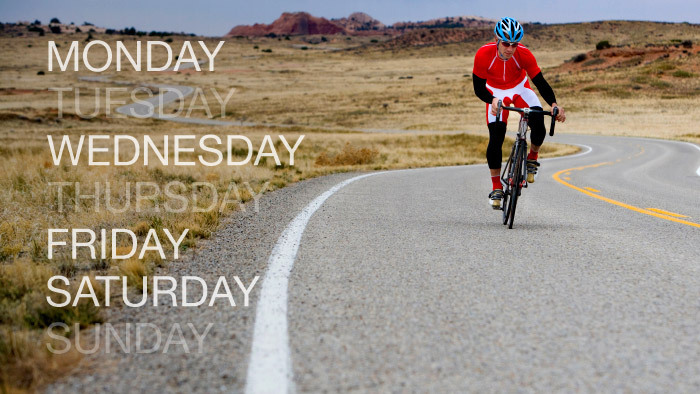 Even at the most intensive portion of a time-crunched program, a well-balanced 4-day schedule might include two VO2 max workouts, one threshold workout or fast group ride, and one endurance ride per week. Less time to train means you have less time to waste. While all athletes benefit from recording and analyzing accurate workout data, these behaviors are even more crucial for time-crunched athletes. Most time-crunched athletes compete in short events like criteriums, cross-country mountain bike races, sprint- or Olympic-distance triathlons, and cyclocross. Use a power meter and other devices that can measure the kilojoules and energy expenditure required for competition, and then make sure you’re achieving similar expenditures in training. In a fast 45-minute criterium, for instance, you might produce 750 kilojoules of work. That might take you 60-75 minutes to accomplish in a training workout, but gives you an important data point to use in planning your training. You may also learn that you need to produce 400 watts for three minutes in order to stay at the front for the final lap of a criterium, and that information can guide the specificity of some of your high-intensity interval workouts. More than anything, people who are successful as time-crunched athletes have clear expectations about what they want to accomplish and are capable of doing. Time-crunched athletes can be fast, powerful, and win races; but there are some limitations inherent in training only 6-8 hours a week. You will perform best in shorter events like those mentioned earlier, because these tend to rely more on high-intensity efforts for winning moves. In longer events where attrition plays a bigger role, time-crunched athletes are at more of a disadvantage because they lack the deep base of aerobic fitness that high-volume trainers have. Time-crunched athletes also have to be realistic about how long they can continuously train using a high-intensity, low-volume schedule. In practice, athletes can typically build for eight weeks (with a recovery week around Week 4) before needing a substantial recovery period (about four weeks). During this recovery period, it’s important to maintain the consistency of training, but shift the focus of your rides from intense intervals to endurance-building aerobic rides. You may not have a lot of time to train, but that doesn’t mean you’re not passionate and committed to being a high-performance athlete. You want to be fast and powerful because it’s a lot more fun than being slow and getting dropped. If you embrace the idea of being a low-volume athlete, you can realign your training so you’re fast and powerful for a few key periods of the year. Considering that the alternative is being mediocre all year long, that’s a bargain most time-crunched athletes are happy to take.